Dr. OZ | "Get Up and Get Moving"
Push on the arrow to watch. Some people have told me this shake acts like a detox to them. Many have lost lot’s of weight using this shake in the morning. I really feel it’s the fiber in the shake that many of us lack. I thought I would post it because I had a few comments on the past shake post that asked if this was what they showed on his show. 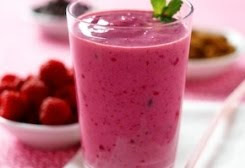 I did not watch today’s show but this shake is a wonderful way to stay healthy… Enjoy! 1 handful of fresh spinach. You and your kids wont even taste the spinach. It’s the only way I can get my 5 yr old to get his veggies. 2 scoops of vanilla or strawberry protein powder of your choice. 2 teaspoons of flaxseed oil. Such a healthy twist. You wont even taste it. There is also a beauty tip using flaxseed oil. It is great for making beautiful hair, skin and nails. Combine all ingredients in blender with a small amount of ice until smooth and serve. Fall is here and this is the perfect soup to have on a cold night. ENJOY!! It is so yummy!!!! !